The issue of open access to journals and literature. The Yorkshire Archaeological & Historical Society has completed a major investment in digitizing their journal from volume 1 (1870) to volume 82 (2010). The journals are also searchable and can be downloaded in a range of formats. There are many important Mesolithic and prehistoric articles. Volumes from 2011 until present are commercially published by Maney, followed by Taylor and Francis, and so digital and print copies are available for a charge to non-members. A post-free month, and then two come along all at once! I dare say there’s a third fermenting somewhere in the back of my gaseous, bubbling, overly-knapped, conchoidially-fractured, corticated and (breath) patinated mind. Microburin is coming up for a breath of Spring air and a transition to other duties—back to the lithics lab and conference planning. Many of you know I’m a voluntary editor for Council for British Archaeology Yorkshire and voluntary chair for the refreshed Teesside Archeological Society (now with on an upward-trending membership again). I’m proud to contribute to both organisations. Much of the winter was spent editing CBA Yorkshire’s FORUM YORKSHIRE archaeological journal. This is a new series that sits between the informality of past magazine-style annual publications and the more traditional county and thematic periodicals that we must complement. I think we have found our sweet spot whilst maintaining a standard that attracts a broad range of well-written articles spanning the variety of archaeology in the county—academic research, commercial developer-led, educational and community. In this year’s volume 2 (for 2013), while somewhat volatile in terms of the readiness of committed articles and their respective back-end project progress, I think we have managed to create a portfolio that does justice to the scope of activities happening across our Ridings. The excellent contributions under two banners, in particular, give us a unique mix and presence in the publication record: Communities In Action and Behind The Scenes give voice to multifaceted community ventures, some completed and others in-progress, as well as demonstrating some of the inner mechanics of the archaeological discipline and its many allied specialisations. I am particularly pleased to host papers from the Archaeology Data Service (ADS) courtesy of Catherine Hardman and Potted History—artisan archaeological potter Graham Taylor who continues to supply expertly researched and skillfully rendered replica ceramics to the likes of Stonehenge visitor centre and many museums. His grooved ware renditions are, simply, huge in every respect! The debate between the value-by-weight of print versus electronic publication is one side of the story. With a typical 50% of CBAY Membership who are Internet-enabled, paper still holds a special value and a relied-upon communication vehicle, no matter the increasing postage costs. Rural Internet (broadband) access, most especially across a County with profound wi-fi topographic dynamics—the utterly urban to the completely rural (BT and UK Government take note)—are veneered with a generational capability in terms of computing confidence. With a demographic, also nationally typical, that sees a majority membership over the age of 55, we are far from a tipping point wherein “online” would be a reasonable expectation for all. Let me ask: how comfortable do we all feel with the corporate/banking/government coercion toward a ‘paperless’ life, especially when so many transactions rely upon proving identity and residence by virtue of providing original paper records? We’re in a quandary. Moreover, the Heartbleed openSSL security bug debacle hasn’t helped. Who is safe as the first hackers and abusers are arrested? Hence, CBA Yorkshire have agreed upon full, free open access to our journal after a grace period of one year—green access level. FORUM YORKSHIRE vol 1 (2012) is therefore available online now, tied to the publication of vol 2. We’re using ISSUU as an e-publishing vehicle and maintain a PDF download using Dropbox. As time allows, our plan is to host all papers via ADS too in PDF-A archive format. It will take a little time to prepare this, with due diligence. 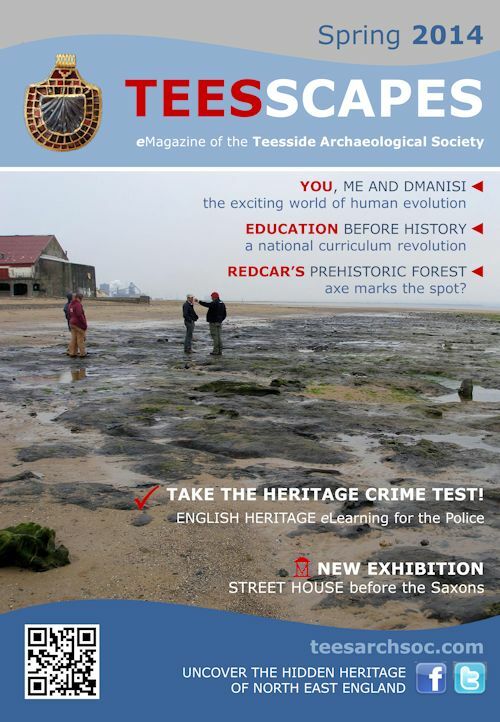 The second major effort has been TEESSCAPES, the e-Magazine of the Teesside Archaeological Society. Our presence on the Internet—Email, Website, Facebook and Twitter—have been innovations only recently, literally the last year or two. We started with email using the fantastic MailChimp cloud technology. Our website, hosted on WordPress, appeared just before Christmas. Grasping the social media bullet, Facebook came next—we achieved over 158 followers within a two weeks (I need to shout out here: that was jaw-dropping!) and the comment “at last! TAS joins the 21st century“. That’s my favourite. Girding ones loins, knowing how social media requires regular monitoring and messaging, Twitter followed to complement the suite. And now Facebook and Twitter are integrated into our website alongside regular news posts (backed up with email campaigns). What hour are you in? The major benefit is to reach an extended audience of tens-of-thousands in an instant. While Facebook’s reach is increasingly limited, by function of the drive for advertising-based commercial “promotion” (i.e. you have to pay), Twitter still allows an awesome capability. So, for example, using vehicles (and hashtags) like #YorkshireHour, @RyedaleHour and several others across Cleveland/Teesside and the north-east of England, a lecture invite can reach an audience of over 25,000 people, in a split second. We have garnered quite a few new members, and many more interested followers, as a proven result. All praise for social media, say I! (But not Facebook). The latest edition, TEESSCAPES Spring 2014, also includes two great articles on top-of-mind topics by guest writers. David Mennear, an osteo-archaeologost and TAS friend, guides us through the complex but thrilling world of human origins and the latest discoveries in Georgia and South Africa. Meantime, Kim Biddulph of @SchoolsPrehistory gives us a taste for what the forthcoming inclusion of Prehistory in the English National Curriculum means in terms of teaching readiness and the impact on seven-year olds—this is not far short of a curriculum revolution, accounting for the missing million years of hominin and human presence in Britain. Schools Prehistory provide advice and wonderful resources for teachers. As I eye up the forthcoming seasonal editions of the magazine, I am hoping (and perhaps you can help) for equally insightful and informal contributions that explain the inner and outer workings of archaeology and the significance of recent discoveries. Go on! Write for us? Email teesarchsoc.news@gmail.com. That’s it for now. It’s been a thrilling week on the back of a winter of gruel. Archaeology MUST REMAIN accessible to ALL. At whatever cost—surely? What Would a Punk Public Archaeology Look Like? Lorna Richardson is studying for—and blogs about—a PhD at UCL Centre for Digital Humanities. Her key research areas are “the impact of Internet technologies on archaeology and cultural heritage, Public Archaeology, and the politics and sociology of community participation and social and participatory media.” Lorna is co-founder of the now renowned and international Day of Archaeology. She is also much of the energy behind the new (Committee-less) Waveney Valley Community Archaeology Group. And much more besides. The issue of open access is a boiling pot of frustration (cost) and anxiety (ethics and legality). For independent researchers, like myself, whether previously in academia and/or aspiring to be enrolled, or for community practitioners (I loath the term “amateur archaeologist“) or for members of the public where even access to public libraries is becoming an increasing luxury (if that library has access at all to academic journals, print or online)—open access is a friction point. While governments, UK and Federal US included, are grappling with and legislating for open access to learned materials, funded by or as a part of publicly financed research, the incumbent publishing monopolies are lobbying to parry such initiatives based on “sustainable cost” doctrines, and their financial interests therein. I can certainly vouch for the pain, being outside academia right now, that pay-wall “open access” causes. I subscribe to the few e-publishers and academic societies that I can afford—a gradually diminishing number since I don’t presently have a regular income stream. I am grateful, as a university alumnus, in having access to JSTOR, although in archaeology the titles which are freely accessible are far from comprehensive, especially for fields like Mesolithic archaeology—a discipline that also spans many specialisations in science and social science, the humanities, cultural heritage management (CRM) and derivative disciplines. I am even more grateful for the “green” and (very rare) “gold” open access vehicles that allow me either time-delayed or immediate access to scholarly material. One thing is certain: I will likely be several steps behind those lucky enough to be within formal education or post-doc (yet paying excruciating tuition fees for the pleasure). Open exclusion is part of the reason. That feels neither fair nor productive—the public are an equal and obligatory participant, a partner in our shared heritage, moreso in the evolution and management of our shared environment, the collective owners of our cultural assets? The public are not a simple “consumer bucket” happy to receive amorphous outputs or media sound-bites. Exclusivity and access-by-means are surely forms of cynical discrimination unworthy of our societies, not least those that espouse a lifetime education and education-for-all ethos? Aren’t these educational aspirations also being subjugated to a market-driven “economic return” mandate, naive in its focus on immediacy and therefore myopic in leveraging the true meaning of past, place, presence, well-being and footfall for healthier (and less welfare-costly, more inclusive, more sustainable, more attractive) communities? And yet, if I were to subscribe to the venerable Journal of Archaeological Science (publisher: Elsevier), by example, it would be beyond my budget (online access is a 5-user license). They are a respected and profuse publisher. If I were to pay-to-download every article they publish across monthly volumes in a given year, I would have to pay over $11,000 (obviously far more than the individual subscription, but it does illustrate my point around reasonable cost—many papers are only six or so pages). Something is amiss? Any law of diminishing returns suggests a tipping-point between over-pricing in any given marketplace and realising income streams as a function of volume-based consumer viability—if not “popular” demand. I really don’t mind paying a few dollars/euros/pounds for a worthy, scholarly and life-changing article. I do, however, resent paying $31.50 per article or a mandate to cluster papers into discounted blocks that are still priced beyond my means. These excellently written blogs go a long way to explaining both the terminology as well as the seemingly intractable issues that are not without tragedy. I highly recommend reading them. There are plenty more too. And now think about how YOU are and will be affected, how you will respond, what you will say, how you will canvass for a fairer outcome, what you will do. Prof Julian D Richards (University of York) for posting it on Twitter today. York is also home of the Archaeological Data Service (ADS) who work continuously to digitise archaeological resources for the greater good. The authors of the ASOR blog need to be congratulated for a well-written and well-appraised status quo and portent for some difficult battles ahead.